Edna is name you don’t hear enough of these days. Whilst Molly and Mabel have had a bit of a comeback Edna and Vera are surely due a revival sometime soon. That isn’t why I bought this wine, but as my long campaign to bring back paisley prints is finally seeing some results, it’s time for me to move on and – you heard it here first – Edna and Vera are the future. I bought the wine because I was in a retro mood and fancied a good old fashioned (where old fashioned refers to the 1980’s) Californian Chardonnay. 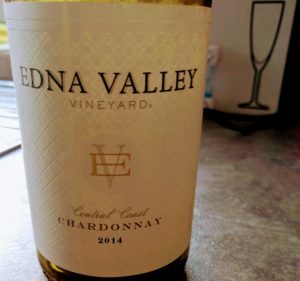 This Edna Valley Chardonnay ’14 from Majestic is a warm lemon colour, not the sunshine yellow I expected, but something a bit more refined. It smells of toasty oak and apple juice. I know apple juice should smell of apples, but it doesn’t, not quite, and this is definitely apple juice and a bit of blossom. It’s just dry, with a medium acidity. It does need to be cold, as it warms up it can tend towards flabby, so keep it in an ice bucket or super ice sleeve. It tastes of apple juice and pears with some lemon and a warm, almost coconut and hazelnut toasted oak. I did like the oak flavour enough to look it up, and it’s part American and part Hungarian oak. Hungarian! I couldn’t help but hear Rex Harrison as Henry Higgins from My Fair Lady exclaiming “Hungarian!” when I read it. It’s not dreadful though, it adds something slightly more European to the oak flavour, not quite French, but part way there, if you take the long way around. Hungarian oak is common in European wines as a more economical alternative to French. That combination of rich sweet fruit and warm, nutty, but not over the top oak works really well. The alcohol level is on the high side of medium which adds to the overall mouthfeel but doesn’t overwhelm it. At £14 it’s probably priced right, but with Majestic’s odd notion where you get a good price if you buy half a case or more of wines from the “mix six” range (which is most of them) it’s a steal at £9. In Scotland such shenanigans are banned, with no discounts or multi-buys allowed on booze, so you can just buy it at the £9 price. Keep one in the fridge for any retro emergencies you have, or to toast any babies you hear of being names Vera or Edna.